...and they actually work, too! 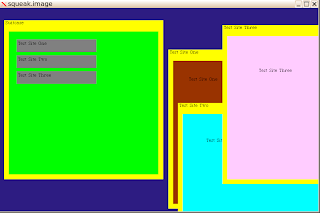 The yellow parts are the borders; you can drag them around, and clicking on them brings them to the front. The Subcanvas API is starting to prove that it really can work. The yellow bits are a subcanvas. Each of those contains a subcanvas with the window contents. The background is a subcanvas. The buttons (grey things with text) are subcanvases and will pop up a brand new window when you click on them. Next up: choose better colours and make the test sites actually do something.